Size Small will fit a child that is 4 feet-5 feet tall. the Large fits anybody over 6 feet tall. The Width for each is the same so it can fit larger or skinnier people. It measures approximately 50 inches wide. -Red Heart Super Saver Medium (worsted) weight yarn: The skeins of yarn are Approx.364 yds (333 m) per skein. Please keep that in mind when you are purchasing yarn. If you cannot get these exact brands of yarn, go to Yarnsub.com to find an equivalent type of yarn. -When you finish this project, you may sew up the “open” side to make this a full cocoon style. You may also crochet a single crochet around the entire edge to “cover up” the edges where you sew in your ends. -To sew in your ends, just take a yarn needle and hide all the ends back into your work. (I do not show how to do this in this video, but if you watch any of my other video tutorials, I show how I sew in my ends if you want to do it like me). -The chain is the same in all sizes, but if you dont want it that wide, chain something that is in groups of 6 +2. So if you chain something that is 114 + 2, you would have 116 chains. I hope that makes sense! -Ch 3 at beg of rnd counts as dc throughout. -sc2tog on “blanket” portion means to go into the middle st of 5dc group, yarn over, go into the middle st of the next 5dc group, yarn over, then yarn over and pull through all 3 loops on your hook. -To make the tail fin bigger: Repeat rows 2 and 3 for however big you want it to be (maybe 60 or 70 stitches), then repeat rows 14 and 15 to decrease for the other half. I hope that makes sense! Row 4: Sc in first dc, skip 2 dc, *5 dc into sc, skip 2 sts, sc in next dc (middle DC), skip 2 sts, repeat from *, ending with a sc in the beginning ch 3, ch 3 and turn. Row 5-50: repeat rows 3-4 (Your last row will need to be a repeat of row 3, so you may need to do an extra row at this point.) If you feel like this is not long enough, or too long, you can add or eliminate rows and just continue to work the next round whichever row you end on. Make sure to end on a repeat row of row 3. The blanket should reach from the top of your hips to right above your ankle at this point. If it does not, make more rows and then go onto the instructions for row 51. Now you will be connecting and working in the round (continuous circle) I highly suggest watching the video to understand this part. Round 51: Sc in ch 3 of beginning of row 50 (this completes the circle), *sk 2 dc, 5dc into sc, sk 2 dc, sc in next dc, repeat from *around, ending with sc in 3rd dc of prev row. Fasten off with long tail, sew remaining hole closed. Row 5-66: repeat rows 3-4 (Your last row will be a repeat of row 3, so you may need to do an extra row at this point.) If you feel like this is not long enough, or too long, you can add or eliminate rows and just continue to work the next round whichever row you end on. Make sure to end on a repeat row of row 3. The blanket should reach from the top of your hips to right above your ankle at this point. If it does not, make more rows and then go onto the instructions for row 67. Round 67: Sc in ch 3 of beginning of row 66 (this completes the circle), *sk 2 dc, 5dc into sc, sk 2 dc, sc in next dc, repeat from *around, ending with sc in 3rd dc of prev row. Row 4: Sc in first dc, skip 2 dc, *5 dc into sc, skip 2 dc, sc in next dc, skip 2 dc, repeat from *, ending with a sc in the beginning ch 3, ch 3 and turn. Row 5-74: repeat rows 3-4 (Your last row will be a repeat of row 3, so you may need to do an extra row at this point.) If you feel like this is not long enough, or too long, you can add or eliminate rows and just continue to work the next round whichever row you end on. Make sure to end on a repeat row of row 3. The blanket should reach from the top of your hips to right above your ankle at this point. If it does not, make more rows and then go onto the instructions for row 75. Round 75: Sc in ch 3 of beginning of row 74 (this completes the circle), *sk 2 dc, 5dc into sc, sk 2 dc, sc in next dc, repeat from *around, ending with sc in 3rd dc of prev row. I suggest watching the video to understand this next part. Sew to tail using photo and video provided at the beginning of this pattern for a guide. Sew in all loose ends. Enjoy being a mermaid!! Check out the popular Shark Blanket here! Share your mermaid afghan on ‘our Facebook! In this video I demonstrate how to make an anchor appliqué to put on the baby blanket I made earlier. This is a great scrap yarn project and can be made in any color. I used Red Heart Designer brand in Red and a J sized hook. This pattern is so easy, there’s no need for a written pattern! Just use 2 stitches: Slip stitch and Half-double crochet! Simple as that! You can make this into a baby blanket, a large blanket, a pillow, a scarf, even a dishcloth! The possibilities are endless! Enjoy the video and Happy Hookin’! In this video I show how to crochet my favorite team’s football helmet. You can change the color and style to fit your favorite team! I do not have a written pattern for this hat, so please follow along in the video to make your very own helmet hat! Happy hookin’! In this video I show how to make monster pants to fit a 6-12 month old baby. I used variations of different patterns to create this. Share this video with your friends!! For the past 10 weeks I participated in The Crochet Crowd‘s Mystery Afghan Crochet Along. Each week, Mikey would reveal a new clue in making this beautiful piece. For years I have followed Mikey and admired his ability to bring an entire crochet community together. It has motivated me to do something similar. This crochet along project has had its highs and lows. I am supremely satisfied with the final product, but at times, I was definitely challenged by it. I struggled with Weeks 4-5, but my favorite was to see the squares as they transformed in Week 3. The highlight of the entire project was making the border. Before that, I felt like it looked like a bag of confetti thrown everywhere, but the border definitely tied it all in to make it a piece that I will definitely cherish or gift. I did have a lot of leftover yarn which I found surprising, but I can always use yarn, so that’s not a bad thing! I would consider doing more of these crochet along projects in the future. I had a lot of fun with this challenge, and each week’s reveal was exciting to see! I would highly recommend trying something like this to any crocheter. Below are photos of each step that I took. 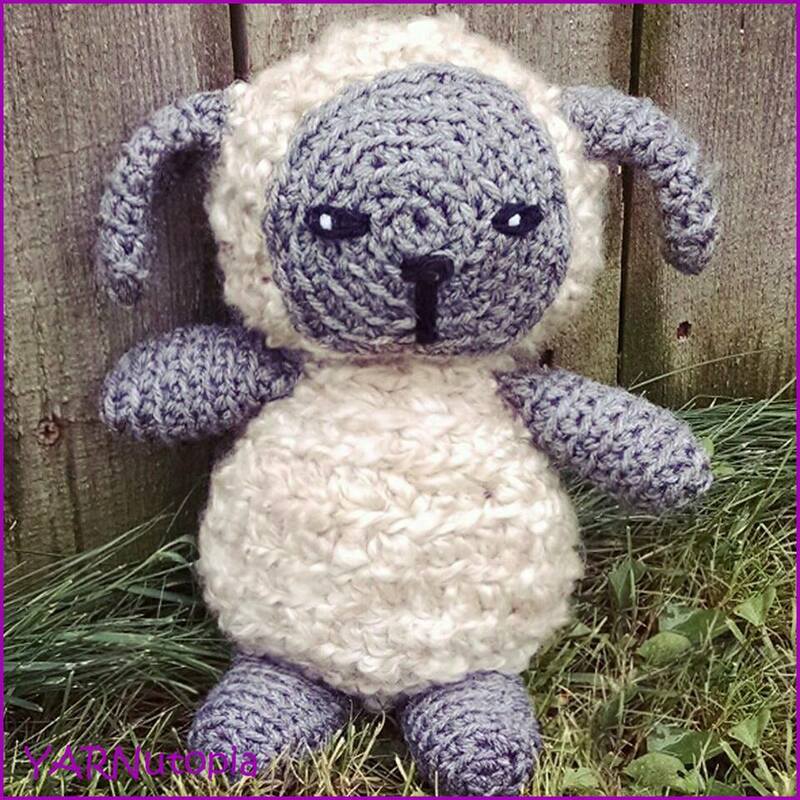 If you click the photo, it will link you to the video tutorial that was provided by Mikey of The Crochet Crowd and Yarnspirations. 4 skeins of Caron Simply Soft yarn in color A, 2 Skeins of colors B, C, and D.
Below you will see three videos on how to crochet this mermaid outfit for a baby. It will fit a newborn to 18 months old baby! Leave a comment, and share this with all your friends! I’m sure they will LOVE it! ‘Under the sea,’ this is the type of mermaid I would be! Click HERE to purchase this blanket! Enjoy making this Badger hat! I made this one an adult size (to fit myself), but if you click here, you can follow this link to the written pattern make smaller sizes. Share this video with your friends and leave a COMMENT on what your favorite animal is–I might make a video on how to crochet it! Click this link to purchase this pattern for all 6 sizes. As a Wisconsinite, I just HAD TO make a Bucky Badger hat to show my team pride! Here’s what I came up with. Click the photo if you are interested in more information. I hope to have the pattern available on my Etsy Shop soon! Taming the tangles! I’m the Yarn Whisperer! HA! This morning I pinned a bunch of scrap yarn to my headscarf and tried to untangle a bunch of yarn that got tossed in a pile. Wish me luck! This may take a while!